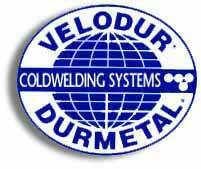 This VELODUR®/DURMETAL® Coldwelding System is as fast as it is versatile. By mixing Base and Activator on a simple 1:1 ratio by volume, a molecular reaction starts and depending on the type used, the repair is completed in 3-4 minutes or 3-4 hours. VELODUR®/DURMETAL® SUPER CA-HD RAPID® allows, for the first time, repairs on oily, greasy and wet surfaces or submerged in water or oil. It is the only known process to stop leaks on tanks, pipes and containers without emptying systems. This revolutionary process combines metallic and nonmetallic materials, cast iron, alloys, PVC, glass, rubber and numerous others. Many of our customers are getting fast results on repairs where conventional methods like welding or epoxies have failed. Sections of leaking tanks can be fixed in 5 minutes by using VELODUR®/DURMETAL SUPER CA-HD RAPID®. No lost downtime, no interruption in production, no loss of valuable material, no fire or explosion hazards. VELODUR®/DURMETAL® eliminates troublesome dismantling of parts or machinery and complicated preparations. 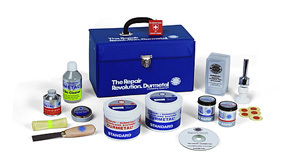 Join the growing number of companies using this simple, fast and economical repair method. We guarantee the technical data provided and also the extended shelf life of VELODUR®/DURMETAL®.